A shift to government jobs, along with employment at places like Trent and in services like health care, has left the city with a healthy economy, he said. At the same time, while the large factories have shut down in Peterborough, the number of small businesses has grown. 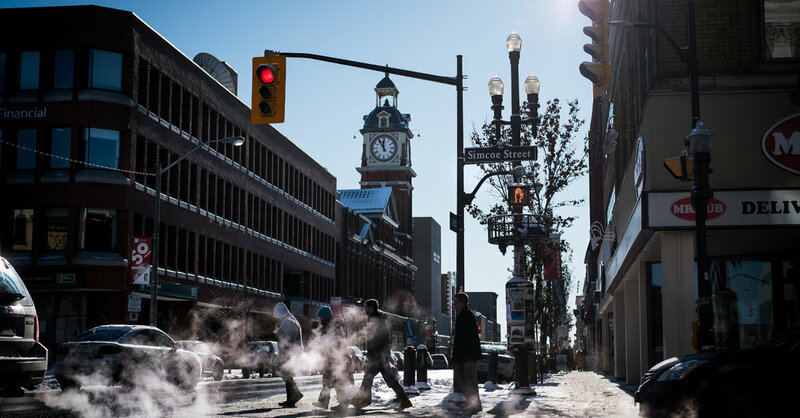 “The Peterborough economy is better positioned to be successful than it was in 1975,” he said. Part of the General Electric plant in Peterborough, which is about to close after 126 years. But Dr. Phillips did acknowledge two significant problems with the city’s transformation. Peterborough’s unemployment rate gyrates. Last summer, it was the highest in the country; last month, it was below the national average. That suggests to him that many of the city’s new jobs are temporary or contract positions. In addition, he said, workers in Peterborough haven’t seen wage gains to match the profit growth of the new companies that have appeared. Certainly few salaries match those of G.E., where factory wages start at 30 Canadian dollars an hour and come with generous benefits. Just as the latest round of Nafta talks neared their opening, Prime Minister Justin Trudeau’s government announced that it had reached a deal to bring Canada into the Trans-Pacific Partnership, another free trade arrangement that had been championed by the United States only to be abandoned by President Trump. The old days before free trade, of course, weren’t without problems. Often inefficient Canadian factories protected by tariffs offered Canadian consumers a limited selection of products at comparatively high prices. Protectionist policies that kept factories running in Ontario and Quebec sometimes limited the ability of western Canada to export agricultural and natural resource-based products because of retaliatory tariffs. Tom Phillips, an economist at Trent University, said Nafta was being used as a scapegoat. But I was struck in Peterborough about the widespread disappointment over Nafta. So I’m interested in the thoughts of Canada letter readers about this. How has Nafta and free trade affected you, your family and friends? Have you given up on “Buy Canadian?” What do you want to see emerge from the current Nafta talks? Please send your thoughts to nytcanada@nytimes.com, and don’t forget to tell us your age and where you live. My colleagues in the Reader Center will go through your replies and publish a selection next week. Read: This City Once Made Much of What Canada Bought. But No More. A highlight of The Times’s Travel coverage are stories the editors call “personal journeys.” About five years after her mother’s death, Karen Schwartz met up in Vancouver with her father, Jerry, for a sailing trip linked to their family’s past. Mr. Schwartz, who is from Calgary, had repurchased a 33-foot sailboat he first owned in 1982. Set aside some time this weekend to read the story of their trip along the coast of British Columbia. Also in Travel, the popular 36 Hours series has just featured Calgary. Among the stops the article proposes is the WinSport park, an idea I endorse. The many wonders of that Winter Olympics legacy include an indoor luge and bobsled track. It’s truncated of course. —Six weeks after the bodies of Barry and Honey Sherman were found hanging in the basement of their mansion in Toronto, the police have concluded that they were murdered. —Three politicians stepped down this week because of accusations of sexual impropriety. On the political front, it was a particular blow to Ontario’s Progressive Conservatives, whose leader, Patrick Brown, resigned about five months before a vote many had expected the party to win. —The federal government’s requirement that groups seeking federal grants for student jobs must support abortion rights has set off a cultural battle. —The International Real Estate House Hunting feature checked out an unusual and historic place in the heart of Old Quebec City.